As Western Canadian pulp and paper producers continue to face significant challenges to their long-term business prospects, from shrinking markets as the world becomes more digitized to a new tariff-friendly neighbour, the fact is that the profit truly might be in the waste pile. Hog fuel, essentially the leftover bark, wood chips, shavings and sawdust from the wood product manufacturing process is finding higher prominence as a potential new income source for the pulp and paper sector primarily as a ‘carbon neutral’ biofuel alternative to fossil fuels. Nearly all Canadian pulp and paper producers now use some or all of their hog fuel to generate power, both for internal use and as a marketable product, but the full extent of its potential as a biofuel product is only now emerging. With that in mind, a British-based company called, Active Energy Group (AEG), has been working hard for the past five years to gain a foothold into the Canadian bioenergy production market, with their most recent marketing thrust being the promotion of their CoalSwitch technology. AEG recently opened a CoalSwitch biofuel production facility in Utah. It claims, with the backing of research investigating the CoalSwitch production process and final product at the University of Utah, that the main benefit of its wood-based biofuel is that it can be substituted for coal without the need for any retrofitting by coal-fired power plants. It describes the finished product as a cellulose-based fuel using low value wood waste, such as forestry, pulp mill and sawmill byproducts. The finished fuel can be delivered in a range of different compacted formats such as pellets, granules, briquettes or bales. After spending several years trying to help three Métis communities in northern Alberta monetize their considerable forest resources through the sale of timber permits and development of wood-based bioenergy plants, the company is now focused on developing a Newfoundland biofuel production project. Unlike Alberta, AEG CEO, Richard Spinks, says that they have found a government much more agreeable to work with because commercialization of the forest in the Newfoundland Northern Peninsula is to their mutual benefit. The timberlands being made available to AEG in Newfoundland were turned back to the Crown by Cornerbrook Pulp and Paper in 2010. According to a government assessment of the forest resource in that area, the timber is primarily smaller diameter balsam fir and black spruce, described as difficult to monetize for solid wood products, making the AEG business proposal to use the wood primarily as raw material for biofuel production a good alternative. Spinks says that AEG is currently involved in the negotiation and due diligence process with the Newfoundland government regarding their plans for a biofuel facility in Roddickton with the goal of achieving a full agreement very soon, adding that there is strong local support for what the company has planned. “Everything is looking very solid there and we will be announcing something I hope in the very near future in terms of moving the situation onto more of a commercial footing,” says Spinks. The company has earmarked $47 million (US) for capital spending on this Newfoundland project this year. They are hoping to locate their biofuel production plant at an idled sawmill and pellet plant located in Roddickton that will produce 40,000 tonnes per year, using wood fibre from their forest holdings, as well as wood waste from other suppliers, but are waiting for government approval to initiate Phase 1 of their investment plan. The company anticipates that five to seven ships will transport their biofuel through the nearby port of St. Anthony to markets in Europe, where Spinks says that they have already secured buyers. They are also hoping to develop a local market for their biofuel to use as a heating fuel alternative to propane and natural gas. The biofuel production plant is expected to employ about 56 people in Roddickton and another 14 in St. Anthony. More people will be employed within their forest harvesting operations. The Newfoundland and northern Alberta projects are just two of many potential projects that AEG is investigating in Canada. Spinks says now that they have a demonstration of their technology in Utah, he anticipates greater interest and faster development of future projects. One particular raw material source that is noteworthy and being investigated by AEG is the potential conversion of the large volume of salt-laden hog material on the B.C. 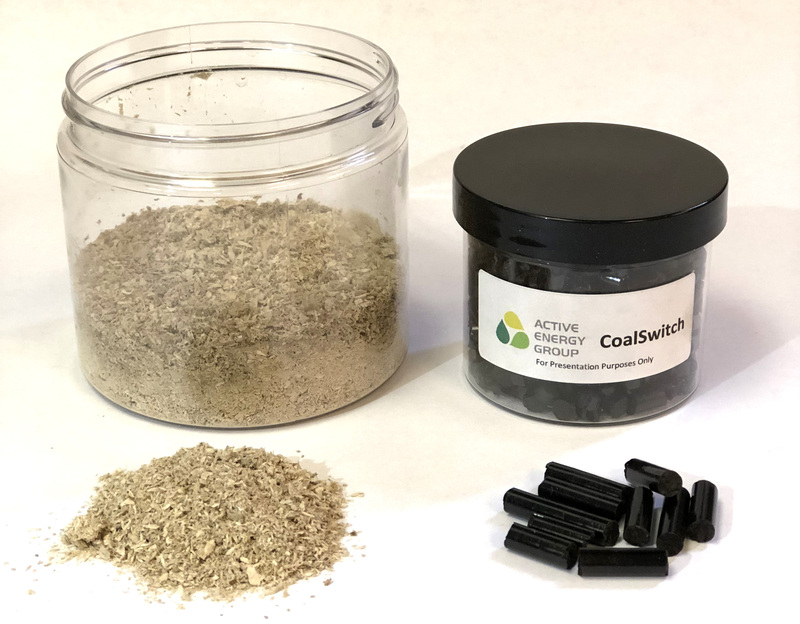 Coast into biofuel using the company’s CoalSwitch technology. Spinks says that its technology is capable of converting this raw material into biofuel, which to this point, has proven difficult to accomplish because of its salt content. AEG claims that its process ‘cleanses’ the biomass raw material of salts, minerals and other contaminants before the conversion process.